This iExpressions lets a 2D or layer move like a roller coaster. To use it, proceed in the following steps. 1) Draw the roller coaster track as a mask path 2) Copy the mask path and paste it to the position property of the layer. Now the layer moves with a constant speed along the roller coaster track. Instead of using a mask path, you can also keyframe this motion by hand (e.g. when the desired path is 3D). You only need to make sure to make the keyframes "rove accross time" such that the layer moves with constant speed before the iExpression is applied. 3) Apply the iExpression to the position of the layer and adjust gravity, start position, and start speed to get the desider movement 4) Adjust max speed and friction to fine-tune the movement. You can also link those properties to sliders to animate them over time. This allows, for example to manually slow down the roller coaster at specific points in time. Now you have a single Layer that moves like a rollercoaster. If you want to animate several layers such that they behave like different wagons of the same roller coaster, you better do not apply the "Roller Coaster Master" to each of them, but better proceed as follows. I) Animate a dummy layer (e.g. a NULL layer or solid) as described in steps 1-4 II) Duplicate the dummy layer and set the "Output" property of the iExpression to "Master Data" in the first and to "Track Data" in the second copy. IV) Apply the "Roller Coaster Wagon" iExpression to position and rotation of each layer that should become a rollercoaster wagon. Link the parameters "Link To Master Data" and "Link To Track Data" to the positions of the respective layer from step II. Use the "Position Offset" parameter to position the different wagons. V) If a wagon is rotated upside down, set its (keyframe value of) rotation from 0 to 180.
determines, at which position of the track the roller coaster starts. A value of 20 means, for example, that the roller coaster starts at the position where it has been at frame 20 before the iExpression was applied. determines how fast the roller coaster accelerates when it moves downhill. Determines how well the wheels of the roller coaster are oiled. The higher the fricion, the more the roller coaster deaccelerates. You can also link this property to a slider. When you increase the friction at some point in time this is as if the pilot of the roller coaster would start breaking. is the maximum speed the roller coaster can have. Whenever the roller coaster tends to gets faster, it is automatically deaccelerated. You can also animate this value over time by linking it to a slider. 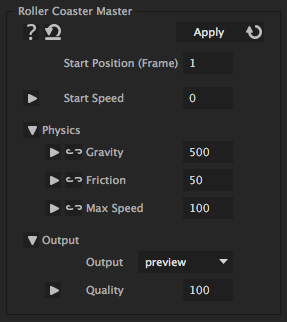 By this you can, for example, stop the roller coaster at some point in time by keyframing the max speed at this point to 0.
leave this value at 'preview' to see the movement. The other two alternatives are needed only in combination with the "Roller Coaster Wagon" iExpression. determines the quality of the physics simulation. The higher this value is the slower is the computation but the more realistic is the movement.